1. Spreadsheet not Calculating due to Circular References Settings. This is the most common issue and fixes most calcuation problems. Keep this setting on at all times. PC: Go to File -> Options -> Formulas -> Enable iterative calculation. Set the maximum iterations to 50 and the Maximum Change to 1. If you have already installed the Caldes Add-In but can't see it, go to Excel and search for the word 'Add-in'. It should come up with 'Insert an Add-in'. (They do keep changing it). 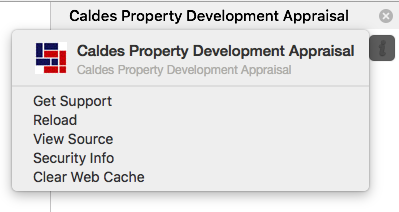 Open up the pop up and click on 'Caldes'. It should be in the list under 'My Addins'. Just double click on it. You will have to log in again. Press L1 for a quick license check. If that does not work press L2. Not that you should not have to do this every time. If you do then maybe you have not installed correctly in which case, go back over configuration. click on that, click on 'Clear Web Cache' and then click 'Reload'. To further troubleshoot the add in click here . then we may need to reset your password. 3. New Project Wizard Missing. If you have started the New Project Wizard and then done something else and want to go back to it, go to Help -> H1 and it should pick up from where you left off. 4. Sections are missing on the appraisal. First see point 1 above. If this is correct, have you run the Health check? This must be run at least once on completion of the New Project Wizard. To run the Health Check press Help -> H4. For Project Construction fees press Controls -> Q1. 5. Excel Freezes when using the mouse scroll wheel. We have found that if you press any button in the panel and then use your mouse wheel before clicking on the spreadsheet, then the page can freeze. It will sometimes come back if you wait, or you can MAXIMISE any other Window (e.g. a browser) fully over the spreadsheet and then hide it again and the spreadsheet will come back to life. This is some kind of Windows / Excel bug. To avoid this, always click on the spreadsheet before scrolling. This is usually because you have the wrong file type selected in the 'Save as type' selection. E.g. it might say 'OpenDocument Spreadsheet' or something like that. It should say 'Excel Workbook (*.xlsx)'. If this keeps happening then then you should go to Excel Options -> Save -> and make sure that the 'Excel Workbook (*.xlsx)' option is selected in the 'Save files in this format' section. This may fix some crash issues. Right click on the Windows start button, and select Control Panel, Programs and Settings. 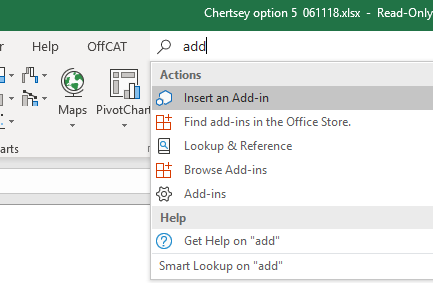 Find Office and either click on it and then Change up at the top, or right click and select Change. A repair options dialog will appear. There is both a quick repair and an online repair. Do the quick repair, Open Excel and see if all is fixed. Click here to download Microsoft OffCAT Office Scanner. This great tool from Microsoft will help fix your Excel, Word and Outlook programs. Make sure you run the tool repeatedly until you see the message 'No issues detected'. This tool is really worth having regardless. As a last resort, do you have another PC or MAC you can use? Can you reinstall Excel / Office? The odd corrupted Excel version just will not run Add-Ins very well. It is very rare.